I haven’t had rugs in my house for years. My old apartment had a huge living room, and I had a rug in there (this rug!) that was 1) Not as durable as my lifestyle required, and 2) That the dog got so sick on that I had to haul it out to the dumpster in the middle of the night. I never put a rug in that room again, partly because I knew I wasn’t going to be in that apartment for years to come, and also because I would have needed at least a 9x12 rug and even the cheapest rugs in that size get pricey. When I moved into this house, I knew I would need rugs. Lots of rugs! I created a rug budget, I needed so many rugs. But knowing that you need something and choosing that something are very different things. My living room is basically like a big, comfy hallway. The front door opens right into it, and including that one, there are FOUR doorways into this room. My house isn’t even that big, but to get anywhere, you have to go through the living room. I wanted a rug that could withstand that kind of traffic, plus a dog. I was looking for so many rugs that I started getting ads for rugs on Instagram - and that’s how I learned about Ruggable. Ruggable is a two-piece rug system, with a top layer that can go in your washing machine - even the 8x10! The first layer is the rug pad, which protects the floor, provides cushioning, and keeps your rug from sliding around. Then the top layer, which you can get in myriad patterns and styles, sort of magnetizes to the pad - that’s the part that can go in the washing machine. This is the PERFECT solution for me and my house, but it could also work well as a hallway runner, in a kitchen, or anywhere where a rug is going to get a lot of use - and might occasionally need a good clean. I got three samples from Ruggable before choosing, and I’m so glad I did. I was pretty sure I wanted the Cambria Ruby, but I also got Cambria Sapphire and Lunja Plum samples. I ended up choosing Cambria Sapphire based on the samples, so it definitely made a difference seeing them in real life. Plus, I was getting an 8x10 rug, and I have no idea how I would have returned it if I wasn’t sure about my choice. 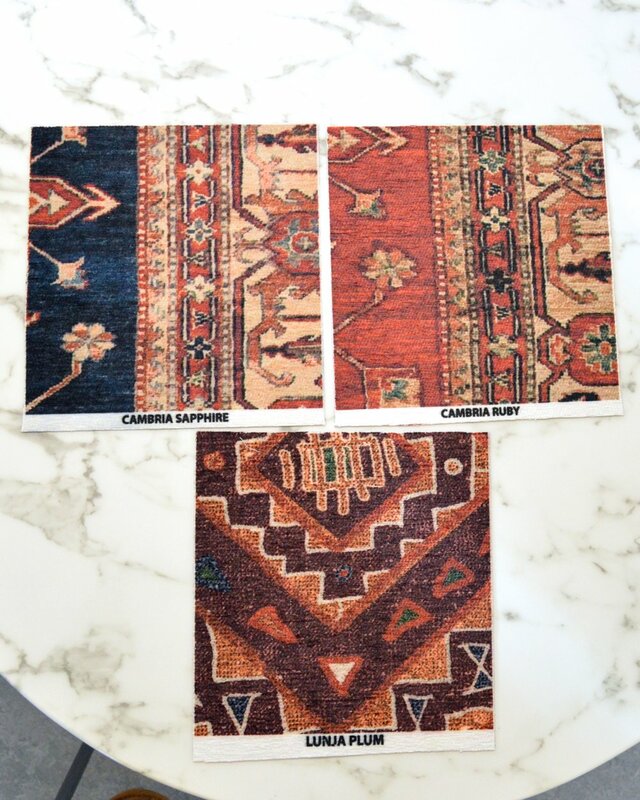 The samples are $5 each, they’re BIG (10” square), and they come with a little fact sheet that tells you how the rug system works and even includes a piece of the rug and the pad so you can see how thick they are and how they stick together. I got my rug in a Black Friday sale, and I think it was 20% off, but even without a discount these rugs are very reasonably priced: An 8x10 with pad and cover is $400, and you can buy the cover solo if you want to change your style but don’t need a new pad. I haven’t washed my rug in the washing machine yet - but I DID need to spot clean after, of course, the dog barfed on it. It cleaned up like a DREAM. I even used OxyClean (I tested an area that’s under the couch just to be sure) and it looks good as new. Also, I read this review of someone who actually washed their Ruggable rug, because I wanted to know if it was really, truly able to be washed in a machine. The hype is real. Ruggable makes the best rug I’ve ever owned.